Bengali daily Bangladesh Pratidin has celebrated its ninth anniversary through a reception event to recognise eminent personalities for their outstanding contributions to various fields. Five renowned personalities, including poet Shamsur Rahman (posthumous), singer Sabina Yasmin, film actress Sarah Begum Kabari and Farida Akhtar Babita and television personality Hanif Sangket were honoured with awards for their outstanding contributions in respective fields on on Saturday. 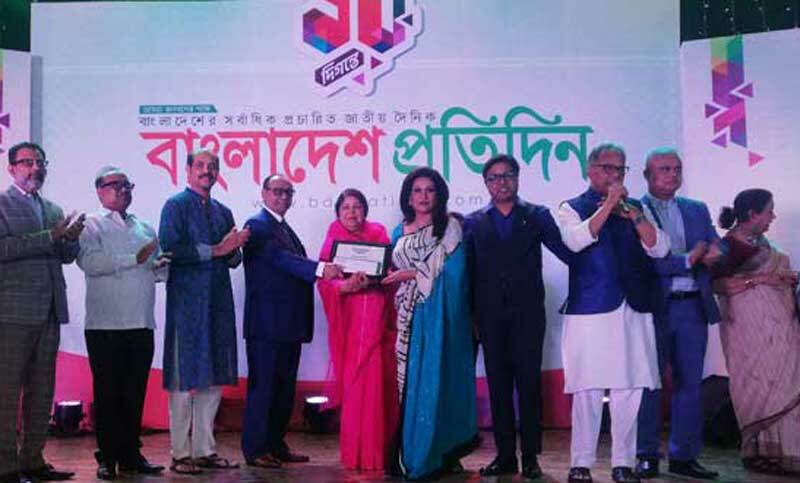 Jatiya Sangsad Speaker Dr Shirin Sharmin Chaudhury and Bashundhara Group Chairman Ahmed Akbar Sobhan handed over the awards to the recipients at a day-long celebration at International Convention City Bashundhara (ICCB) in the capital. Alongside of the reception, the celebration programme began with a get-together for readers and well-wishers. Bashundhara Group Chairman Ahmed Akbar Sobhan atended at the event as chief guest. Meanwhile, well-wishers and readers started to join the celebration from Saturday morning. Bangladesh Pratidin Editor received the flowers from guests while the newspaper's Special Correspondent Shaban Mahmood moderated the session. Awami League acting General Secretary Mahbubul Haque Hanif, Joint Secretary Jahangir Kabir Nanak, Youth and Sports State Minister Zahid Ahsan Russel, Dhaka North City Corporation (DNCC) Mayor Atiqul Islam, Water Resources Deputy Minister Enamul Haque Shamim, BNP Chairperson's Advisor Mohammad Mahfujullah, Election Commissioner Mahbub Talukder, Jatiya Samajtantrik Dal General Secretary Shirin Akhter came to wish the newspaper. Daily Sun Editor Enamul Hoque Chowdhury wished the sister concern media along with Chief Correspondent Firoz Al Mamun. Other guests are: FBCCI former President AK Azad, BGMEA President Siddique Rahman, America Bangladesh Chamber of Commerce President Atiqur Rahman, footballer Zakaria Pintoo are on the floor. Poet Shamsur Rahman, a key figure in Bengali literature, started off with his first book – Prothom Gaan Ditiyo Mrityur Aage—hitting the stands in the 60s. Besides, another masterpiece by Shamsur Rahman – Bandi Shibir Theke – tells the stories of the country’s glorious liberation movement. Acclaimed singer Sabina Yasmin is one of the key figures in Bangla music. She is renowned for her patriotic songs as well as her playback singing. She has recorded around 12,000 songs. Sabina received numerous awards, including the Shadhinota Padak and Ekushey Padak. Film star Sarah Begum Kabari vibrated the silver screen for two decades after her debut in the film industry through Subhash Dutta’s masterpiece – Sutarang in 1964. Afterwards, she continued gaining minds of people through her work in Heeramon, Maynamoti, Chorabali and Titas Ekti Nadir Nam. Kabari received many awards, including the Bangladesh National Film Award for Lifetime Achievement. Legendary actress Farida Akhter Bobita came into light through Satyajit Roy’s film – Ashani Sangket. Then she had continued her excellence in more than 250 films. She was honoured with National Film Award in 2018 for her outstanding contributions to the film industry. Hanif Sanket has a special identity in the country’s cultural arena for bringing out unsung heroes of the society through popular television programme – Ittyadi. Sanket was awarded the Ekushey Padak in 2010. Earlier on March 14 evening, the newspaper started its anniversary celebration through cutting a cake at its head office in the capital. Bangladesh Pratidin started its journey on March 15, 2010, as a venture of East West Media Group Limited which is owned by country’s leading business conglomerate Bashundhara Group. In its decade long journey, the newspaper has gained popularity among Bangla-language people across the globe. The newspaper also publishes Europe and America editions.